Alesis may have discovered a market niche for themselves with the new PercPad - it is competitively priced, conveniently compact and as easy to use as rattling a maraca. Clear, faithfully produced sounds. Pads are sensitive enough for stick or hand playing. Price. It would be better if the default edit mode was 'assign'. 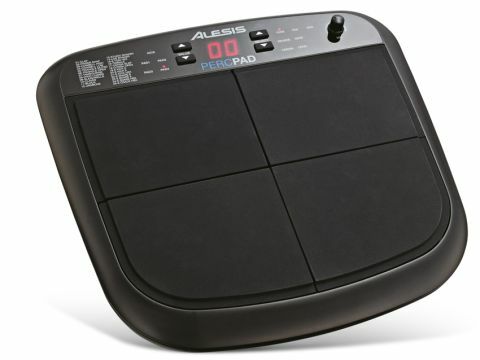 The Alesis PercPad is a four-zone electronic pad which comes complete with a modest selection of the 'most in-demand' drum and percussion sounds including block, clave, cowbell, timbale, clap, wind chimes etc. At its widest point, the PercPad measures just 38cm, so it's small enough to be able to integrate into a percussion rig or a kit set-up with ease. It may be attached via a mounting bracket (available for approx £20), placed in a snare stand or simply laid flat on a percussion table, for example. At just under £80, the PercPad vigorously upholds the Alesis ethos of providing affordable electronics for musicians. The casing housing, containing the electronics, pads etc, is constructed from an impact-resistant ABS and is finished in a subtle matt black. The pad striking areas are made up from four individual chunks of dense black rubber, inset within the ABS casing itself. While these velocity-sensitive pads are designed to be walloped with sticks, they are also sensitive enough to be played with the hands, or a combination of both - great news for percussionists and kit players alike. Depending on which mode is selected (Tune, Pan, Reverb, etc), an LED illuminates to show the selected mode and which one of the four pads (or trigger) is currently being struck or selected for editing. To the centre of the top panel is a largish LCD which shows the number of the selected sound, displays a range of alpha-numerical parameters, including tuning, level of reverb, pan, volume, MIDI note number etc. The underside has a set of rubber feet at each corner, a neat cable grip for the power adaptor and a recess for the optional mounting bracket. Once powered up, the PercPad becomes immediately playable, defaulting to 'PAD1' and 'TUNE' - we think it would have been more practical to default to instrument assignment 'ASSIGN', as this would be the first thing to be altered during a performance. Still, just two clicks down of the mode 'SELECT' button, whack any pad you wish to alter and choose the sound from the printed listing and begin playing. Easy peasy. With each strike of the stick the pads manage to faithfully reproduce the sounds and the reverb adds elements of realism where necessary. The rebound is instant and certainly good enough for live performance or perhaps even a bit of practice if you feel inclined too. Most of the sounds produced are clear, crisp and, though we're not sure of the available polyphony, there seems no noticeable chopping-off of any sound, even when playing the longest sample of the wind chimes and a double-stroke frenzy.